Counting in 2's, 5's and 10's. Count by fives from zero to one hundred! Finding and making number bonds. Counting on using a number line. We have been using number lines to help us count forward and backwards. This skill will help us with our addition and subtraction. We even played a number line game, the first one to zero wins! We have been comparing number bonds to ten and working out whether they were the same or different. We used different resources to help us work it out such as counters, cubes and numicon. We have been working on addition using our part-part whole model. We have used our Maths Master boxes to help fill the models! 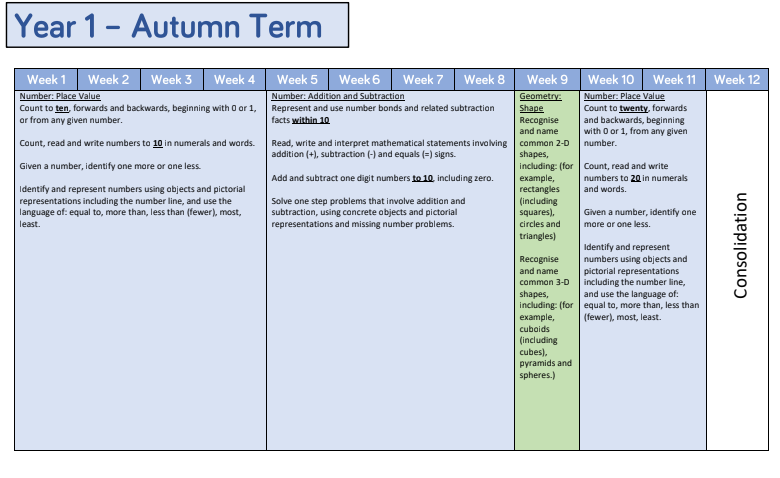 This is our termly overview for maths that we will be following. We have been focusing on counting to and back from 10. As a class we have sung songs, played games and used different resources to help us. I have shared some of the songs that we have been singing as a class.